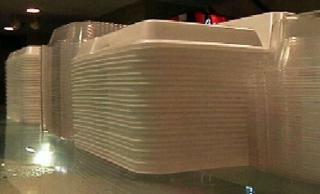 Montgomery County may join D.C. in banning the use of styrofoam food packaging. The bill would prohibit the use of foam food service products in the county's restaurants. The sale of those containers and foam packaging (i.e. packing peanuts) would also be outlawed. “It never biodegrades, but it breaks apart, making it especially difficult to clean up. Recyclable and compostable alternatives are readily available and competitively priced, so there is no reason for any establishment to continue using foam products," said Councilmember Hans Riemer, who introduced the bill Tuesday. Back in July, Mayor Vincent Gray signed a similar bill banning the use of plastic foam food containers in the District. D.C.'s ban will also take effect Jan. 1, 2016, the same day Mongtomery County has prosposed their ban take effect. Montgomery county officials say their legislation closely tracks the District's bill to help raise regional awareness and help "strengthen the local market for alternative products." Other U.S. cities have also banned plastic foam for environmental reasons.